Adobe provides a free community website for Photoshop Elements 11 users to explore color from a vast number of color palettes and share color combinations with other users. The service is called Adobe Kuler. Before you log on to the Adobe Kuler website, you need to acquire an Adobe ID. You can visit the site without an Adobe ID; but to acquire swatches that you can load in the Elements Photo Editor Color Swatches panel, you need to have an Adobe ID. After you’ve acquired an Adobe ID, visit, go to the Adobe Kuler website, and click the Sign In button the top-right corner. Provide your log-on information (e-mail address and password) and click Go. That’s it. You’re in and ready to acquire some color swatch combinations. As you move around in Kuler, you can always tell whether you’re logged in. You can see two icons adjacent to the icon representing horizontal scroll bars. If you aren’t logged in, only the single horizontal scroll bar icon appears in Kuler. The other two icons aren’t available when you’re not logged in with your Adobe ID. Take a look at the left column in Kuler after you log on. You see several items listed under Themes. 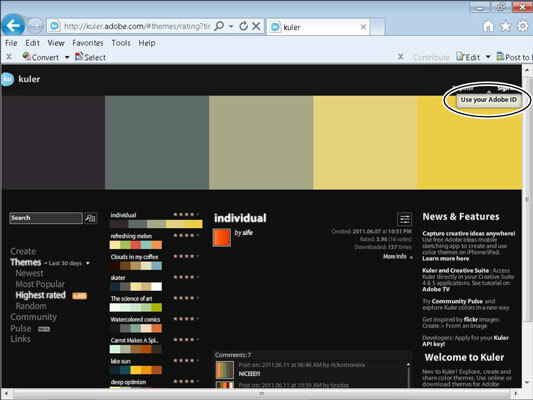 Click Newest to look over some of the newest color combinations uploaded by other users. In the column to the right of Themes, the swatch colors listed are among the newest colors uploaded to Kuler. Click one of the swatch bars, and the colors appear in larger swatches at the top of the window. 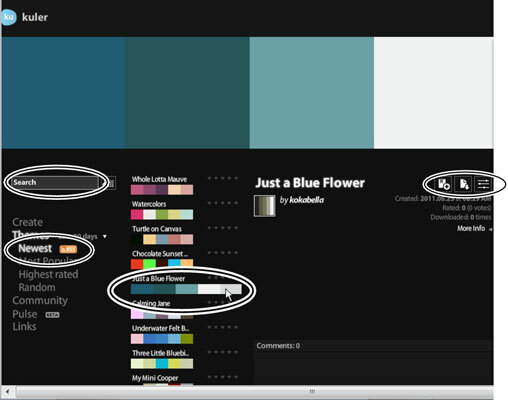 If you find a color combination you like, you can download the colors and import them into your Color Swatches panel. Poke around and view the different swatches in other categories such as Most Popular, Highest Rated, and Random. This site is meant for you to explore and look over various color combinations. Notice the Search text box in the Kuler window. You can search for colors you might like to explore, such as skies, leaves, foliage, landscapes, retro, or any other number of search topics. One truly great opportunity available with Search is exploring color combinations used by master artists. Just type the artist’s name and press Enter/Return or click the search icon adjacent to the Search text box. The search results display color sets used in various paintings by the artist you entered. Notice the horizontal sliders icon in the Kuler window. If you like a theme (or a color set derived from a search) but want to explore it more and make some changes, click the icon, and the screen changes to a view similar to what’s shown. In this window, you can make some choices for different color Rules. In the Select a Rule column, notice the options you have for choosing Complementary colors, Compound colors, Shades, and more. If you click one of these items, the colors in the color set change. In the center of the window is a color wheel. Click any of the items you see represented as circles and drag to new locations to change the individual colors. You have options for changing the Base color, removing a color, and changing tints in this screen. Again, Kuler is meant for you to examine and experiment. You can also choose color from a photo on your hard drive. Click the From an Image button to upload one of your photos. When the photo is uploaded, Kuler plots five points that create a color set from the colors in your photo. You can move the points around the photo and modify the color set from those colors you want to use. You can also explore different moods by clicking items in the Select a Mood column. When you want to download swatches from colors selected in a photo, click the Save button in the window. In the Color Swatches panel in the Photo Editor, you have a number of menu commands available by clicking the Panel menu icon in the top right of the panel to open the menu. Create the color set you want to capture and click the Download icon. The Download button is the middle of the three icons. You use the first icon to select a theme. The third icon is for editing a theme. You only see three icons when you’re logged in with your Adobe ID. If only a single icon appears, it means you aren’t logged into the Kuler website. When you click the Download icon, a Save As dialog box opens. Save the swatch color to the Elements Color Swatches folder on your hard drive. You can save your color swatch anywhere on your hard drive, but if you want it available in the Color Swatches panel, save the file to the Color Swatches folder. On Windows, the directory path is Program FilesAdobePhotoshop Elements 11PresetsColor Swatches. On the Macintosh, the path is Applications/Adobe Photoshop Elements 11/Settings/Presets/Color Swatches. 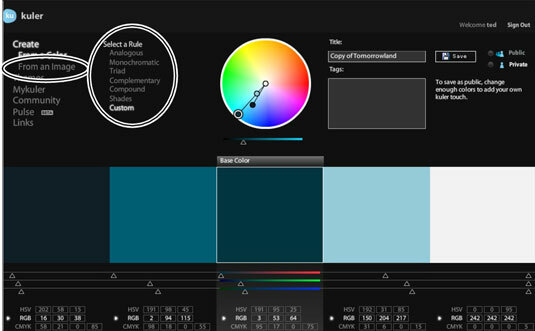 Load the color set by choosing Load Swatches from the Color Swatches panel menu in the Photo Editor. When the Load dialog box opens, select Swatch Exchange (*ASE) from the Files of Type drop-down list (Windows) or Format pop-up menu (Macintosh). If you want several color sets in a single color palette, download individual color sets from Kuler. Delete all colors in your Color Swatches panel and load each of your downloaded color sets. Save the final composite as a single color palette to the Color Swatches folder inside the Elements 11 folder. If you upload a photo and want to save a color set derived from the photo, a Save button appears on the page where photo colors are displayed. Click the Save button, and you download an ASE file just like you do when clicking the Download icon.